Caching is among the most reliable tools for making every website faster, and Full Page Cache is the most effective sort of cache. Although Magento 2 contains this cache type, there is still an issue with frequently cleared cache data that happens when someone makes changes within your store, mainly to categories or product pages. Besides, the cache can be cleared by lifetime: usually, it happens every X hours. As a result, the default FPC solution doesn’t provide the maximum performance, but you can easily solve this problem with the help of the Mirasvit Full Page Cache Warmer Magento 2 extension. 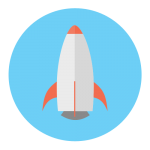 The tool is designed to prevent your store from slowdowns caused by rare cache updating. The extension monitors pages of your ecommerce website and refreshes cache if it is cleared. Thus, all your visitors get the highest page load speed and the best user experience. Otherwise, orders number and revenue decrease since slow performance can lead to the disappointment of potential buyers. Mirasvit Full Page Cache Warmer for Magento 2 works with product, category, layered navigation, and CMS pages. You can configure the extension right after installation, and it will work automatically, doing everything in the background. Let’s have a look at its backend first and then describe the extension’s functionality. The Pages grid contains 8 columns: checkbox, ID, Status (In Cache, Pending, or Unknown), URL, Page Type, Popularity, Vary Data, and Action (you can warm or clean cache here, as well as remove the page from the grid). Filtering options are available for each column except checkbox, Status, Vary Data, and Action. Besides, you can specify how many raws are displayed per page as well as generate pages. As for the Jobs grid, it includes 11 columns: checkbox, ID, Priority, Filter, Info (displays execution time), Status, Created At, Updated At, Started At, Finished At, and Action (Run Job, Delete). Checkbox, Filter, Info, Status, and Action do not offer filtering options. It is also necessary to say a few words about Mirasvit Full Page Cache Warmer Settings available on the Configuration page. They are divided into 5 sections: General Settings, Performance, Extended Settings, FPC hole punch, and Debug. In General Settings, you can enable or disable the extension, choose how to warm pages: by popularity or type, decide which page types should be warmed and in which order, and specify ignored pages. 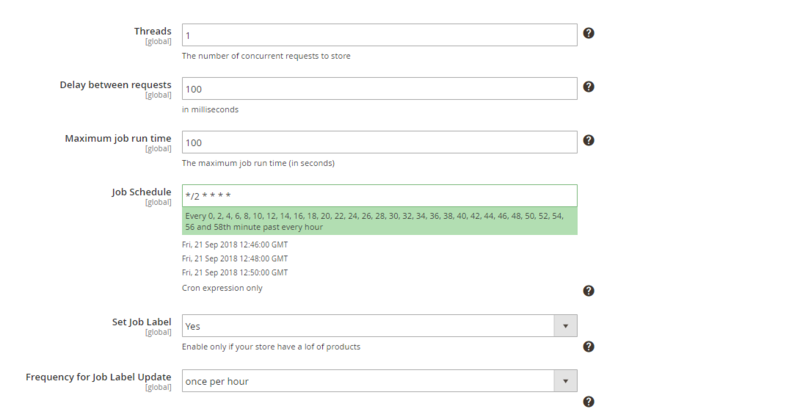 The Performance settings enable you to choose the number of threads (concurrent requests to store), specify a delay between requests and the maximum job run time, and create a job schedule (use only cron expression here). Here you can also enable Job Label and select the frequency for its update. Extended Settings allow you to specify the limit for the average system load in percent that should stop warmer job running, set the crawler limit (number of URLs in the cache), and forbid cache flushing. Here you can also activate “Run warmer as web server user” option, make pages cacheable forcibly for selected pages or all pages, enable warming mobile pages separately, and decide whether to use empty vary data for mobile pages. FPC hole punch is the section where you can configure specific blocks that will not be cached. For each hole punch, you should specify a path to the template containing the block, block class, CMS block ID or Widget code (for custom blocks), and store view. In the Debug section, you decide whether to show cache status of pages on the frontend, as well as information for hole punches and for which IP addresses. Besides, you enable/disable logging of tags and backtrace for cache flushes. 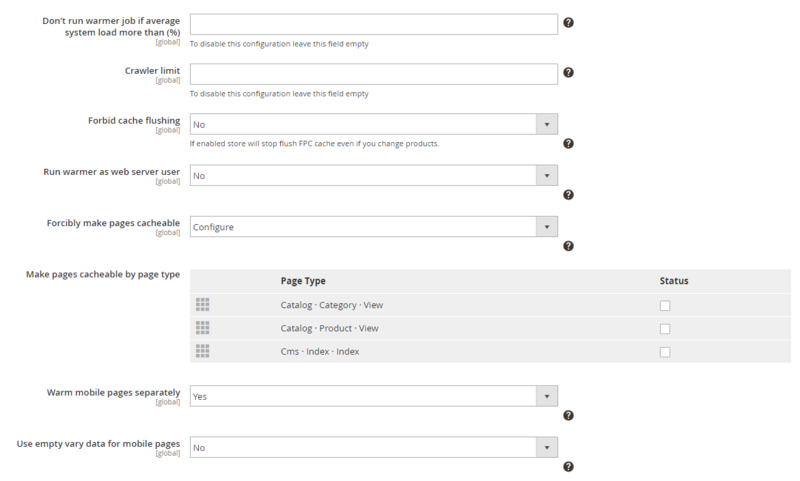 The Magento 2 Full Page Cache Warmer extension provides reports allowing admin users to track page caching performance which effects page loading speed on your website. Fully Automated Workflow. You no longer have to refresh pages and change the configuration of the extension manually. As we’ve already mentioned, Mirasvit Full Page Cache allows you to configure all settings right after you’ve installed it. The module is not only fully automated but also doesn’t have any complicated settings: above, we’ve just shown that you only have to choose page types to be warmed. Cron Jobs in Background. All processes run by the module are carried in the background by Cron, so you are free to operate as usual without any influence on the extensions functionality. Furthermore, Mirasvit Full Page Cache Warmer for Magento 2 doesn’t cause any windows and reminders on your desktop, so nothing will detract you from work. Newly Saved Pages. Newly saved pages are cached automatically without any need to change settings or do something manually. It also works for editing already existing pages. Performance Settings. We’ve already mentioned the simplicity and flexibility of performance settings available with the Mirasvit Full Page Cache Warmer Magento 2 extension. Thus, you can easily get the most out of your store by leveraging such parameters like the number of concurrent requests to your store, maximum run time, and frequency of running cron jobs. Advanced Pages Settings. The extension lets you warm pages with specific conditions. For example, it is possible to take into consideration such data like customer groups, currency, category or product ID, store view, and more. 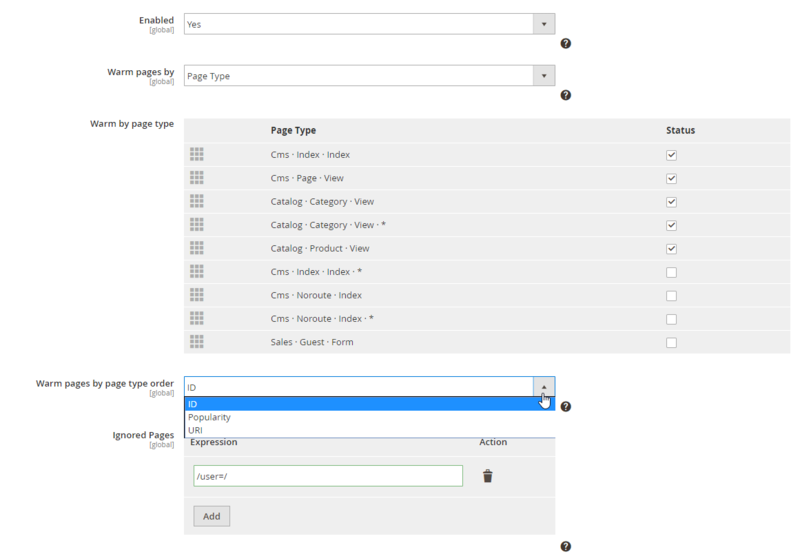 Furthermore, different types of data can be combined for each page type. Consequently, this leads to simple and intuitive optimization and customization of each page type cache version. Priority Management. It is also necessary to mention that Full Page Cache Warmer enables easy priority management. 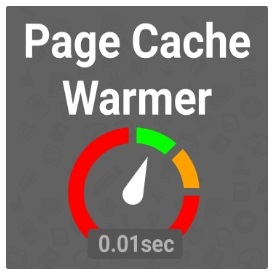 Due to the availability of 2 cache warming types: by page popularity (the number of visits) and page type, you can select the first one and enhance the most demanded pages. Only fresh versions of all store pages! New option: display of cache status for Varnish. New option: fixed popularity for the Varnish cache. Possibility to warm mobile pages separately was added. Now it is possible to make pages cacheable forcibly. New feature: hole punching for blocks. Info block allowing to check if a page is in the FPC cache was added. If you are a Magento 1 merchant, try Mirasvit Full Page Cache. It already includes built-in crawler to keep your cache fresh. Mirasvit Full Page Cache adds the FPC functionality to the platform, dramatically increasing the default page load speed.